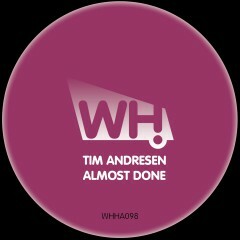 Tim Andresen has been a dominant figure on the house music scene for many years now. The resident DJ at Scandinavia’s leading club Culture Box in Copenhagen for nearly ten years, he switches between headline sets and supporting DJs like James Zabiela, Steve Lawler, Joris Voorn, Nic Fanciulli and Maya Jane Coles. Add to that he has also played across the continents for the last decade and a half. As a producer, Tim has served up productions on quality labels like UM Records, Savoir Faire Musique, Ready Mix Recordings, Natural Rhythm, Seamless, Azuli, Toolroom and Southern Fried to name a few. His new track ‘Almost Done’ has cooked up a buzz since it was featured in the recent WH podcast. It’s a deep percussion-driven affair with a recognisable and softly spoken female vocal. Meanwhile we have Antura Records’ owner Ben Teufel upping the tempo with his awesome remix for the main floors.